As I said, Trumpofsky is not unbeatable. Democrats are set to pull off the largest midterm elections victory in history, according to a breakdown of the popular vote in races for the House of Representatives. The party leads the Republicans by more than 8.9 million votes across the US, raw data compiled by the Cook Political Report, an independent, non-partisan political analysis website. Previously, the largest margin of victory was 8.7 million, which came in the 1974 midterm elections after the Watergate scandal and Richard Nixon’s resignation. Only one House result remains undeclared. Democrats trail by fewer than 500 votes in California's 23rd congressional district, where there are 15,000 votes left to be counted. It means the party is on the brink of flipping 40 seats in the House, reaffirming the emerging assessment that this month’s midterms amounted to a ”blue wave”. Utah’s Mia Love became the latest Republican incumbent to fall as Ben McAdams, the Democratic mayor of Salt Lake County, defeated her by fewer than 700 votes in a knife-edge race for the state's fourth congressional district. She had been billed as one her party's stars when she became its first black congresswoman in 2014. As of Thursday, Democratic candidates had polled 59,351,147 votes in House seats across the country in the 2018 midterms, compared to Republicans’ 50,438,143, according to the Cook Political Report. Democrats are on course for more than 60.5 million ballots in total, the closest an opposition party has come in midterm elections to matching the president’s popular vote two years earlier. Turnout across the country the highest since 1914, with Mr Trump’s divisive presidency and rancorous debates over immigration, healthcare and taxes thought to have driven voters to the ballot box. At least 49.2 per cent of eligible voters cast ballots, the United States Elections Project estimates, compared to 36.4 per cent in 2014. The Texas newcomer would do well to pay attention to what another political underdog did more than a century ago. Of all the places in Washington, Beto O’Rourke chose to run to the Lincoln Memorial. Jogging through an early winter storm in the capital the week following his loss in the race for U.S. Senate, O’Rourke found himself, gimpy knee and all, running up the steps of the majestic monument to the 16th president. There, he wrote in a Medium post, he paused to read the words of Lincoln’s Second Inaugural Address. Suddenly, his knee stopped hurting—as if Honest Abe’s words had a special healing power (but “maybe it just needed to fully warm up,” he wrote). 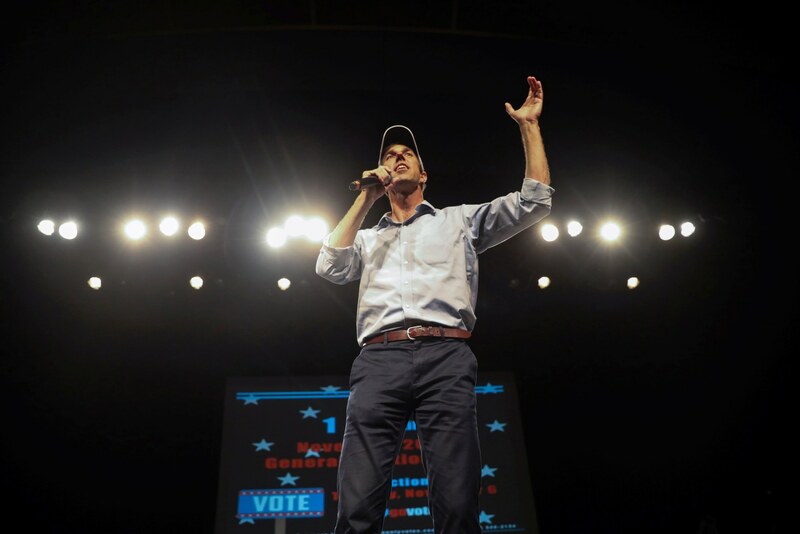 O’Rourke has not compared himself to Abraham Lincoln outright, but that hasn’t stopped others from noting some similarities as they muse about his potential presidential run. 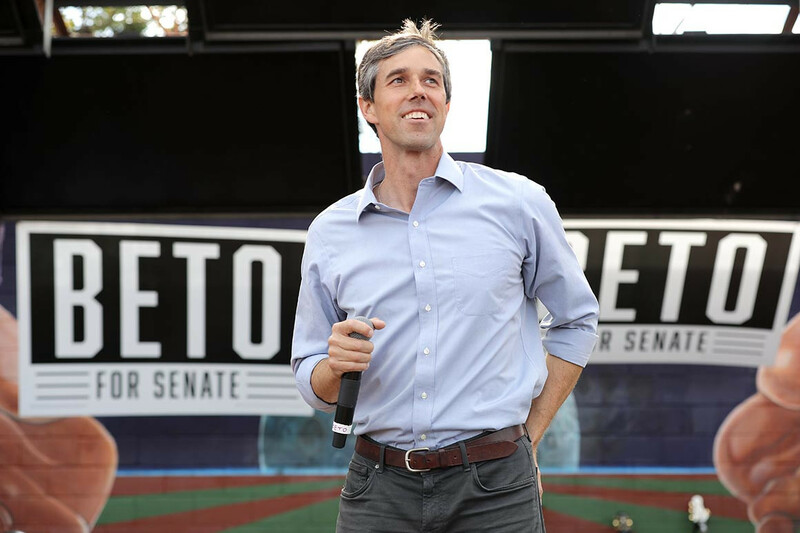 While O’Rourke lost his bid for the Senate to Republican Ted Cruz in red Texas, his fundraising skills, organizational reach and ability to attract throngs of volunteers (his “Beto-maniacs”) have vaulted him into the national conversation about who the Democrats should nominate in 2020. Seen through this lens, the message of his early morning run was hard-to-miss: If a long-shot former member of Congress from Illinois could reach the presidency in 1860, so too can a suddenly not so long-shot three term Congressman from Texas in 2020. But to win the presidency, O’Rourke will not only have to have Lincoln’s luck, but also his withering focus, burning ambition and considerable political skills. And, say several scholars of the 16th president, he would do well to follow the script that Lincoln followed in 1860. There’s more: Lincoln’s loss to Stephen A. Douglas back in 1858, Holzer points out, actually enhanced Lincoln’s reputation, just as O’Rourke’s loss to Cruz has enhanced his. No less than the Texas Monthly (that go-to arbiter of Lone Star politics) noted that while O’Rourke lost his bid for the Senate, his strong showing in a conservative state made him a winner. He came in just 2.6 percentage points behind his opponent, in what became the closest race in Texas in 40 years. 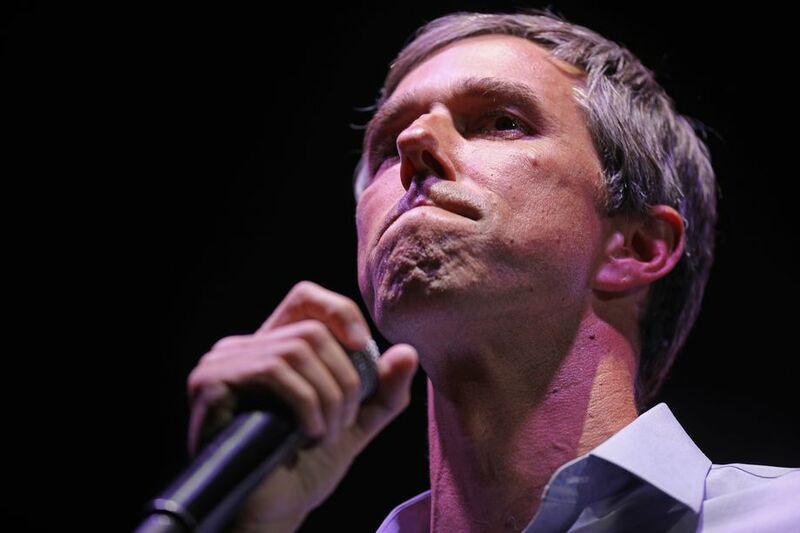 “Beto O’Rourke lost his fight with Ted Cruz while helping his Democratic Party more than any other candidate in two decades,” the Monthly intoned. The same is true for Lincoln. Prior to his 1858 campaign against Douglas to represent Illinois in the U.S. Senate (the election, following the laws of the time, was actually decided in the state legislature), Lincoln was an unknown former one-term congressman. But his debates (which remain legendary) against Douglas made him a national political force. Lincoln’s showing made Republicans flock to his standard. Then too, the Lincoln-Douglas tilt made Douglas, who hedged his position on the issue of slavery, a pariah among pro-slavery southern Democrats (the fight over his presidential nomination, in 1860, shattered the party). Cruz is not a pariah among Republicans, but he seems as deeply disliked now as Douglas was in 1858. Then too (and as was the case with Douglas), Cruz’s near-defeat against an upstart did nothing to endear him to his own party’s stalwarts. Both men, Douglas and Cruz, should have won in a breeze. They didn’t. Lincoln’s 1858 campaign against Douglas attracted unprecedented national attention—primarily because, as everyone knew, the real issue between Lincoln and Douglas was slavery, bringing the issue to the forefront of national attention as no other race did in that off-year election. Almost all of the nation’s major newspapers covered their debates: New York’s three major newspapers (the New York Evening Post, New York Tribune and New York Herald) each sent correspondents (“the prairies are on fire,” the Evening Post enthused), while smaller local newspapers (from far flung Reading, Pennsylvania to Mansfield, Ohio, to name just two) and regional heavyweights (the St. Louis Morning Herald) also weighed in. The same was true for the Cruz-O’Rourke campaign—with the major media incessantly weighing O’Rourke’s chances against the favored Cruz, then featuring on-the-ground television reports of Cruz and O’Rourke rallies. It might seem obvious, but it’s pertinent: Television made the Cruz-O’Rourke face-off a national contest, as newspapers once headlined the Lincoln-Douglas match. The high-profile loss gave Lincoln a one-of-a-kind window, and O’Rourke’s loss may have done the same. If Lincoln had beaten Douglas in 1858 he probably wouldn’t have been a candidate for the presidency in 1860. “Lincoln desperately wanted to be a senator,” historian and author Douglas Egerton says, “and if he had been elected in 1858, he would have probably stayed in the Senate, and conceded the Republican nomination to [New York’s William. H.] Seward. And, you know, running for the presidency while serving in the Senate has proven challenging.” Egerton’s point is borne out in history: Only three candidates have become president while serving in the Senate—Warren G. Harding, John F. Kennedy and Barack Obama. Put another way, Lincoln’s loss to Douglas in 1858 made him available for the presidency two years later, just as O’Rourke’s loss to Cruz in 2018 has made him available in 2020. The same is true now, for O’Rourke, whose candidacy could build a new blue Democratic wall anchored in the southwest and centered on Texas and its 38 electoral votes. The O’Rourke map would include not only Colorado and New Mexico (which Clinton won in 2016) but also Arizona—which Clinton lost. O’Rourke’s “map” appeals to Democrats, just as Lincoln’s “map” did to Republicans. Of course, the test of any political analogy is whether it works in practice. “Lincoln was an absolutely masterful politician,” Egerton says, “and O’Rourke is very good. But is he masterful?” Egerton, who detailed Lincoln’s run for the presidency in his book Year of Meteors, says that Lincoln purposely positioned himself as a centrist on the issue of slavery. “Back in 1860, Seward was viewed as a radical, while Lincoln made statements that would make him more palatable to moderate Republicans. That was absolutely crucial,” Egerton told me. More specifically, Lincoln was helped when, in 1858, Seward referred to the division over slavery as “an irrepressible conflict.” The phrase was viewed as a prescription for war—and Seward was vilified. Lincoln’s deliberate courting of his party’s center is a lesson that O’Rourke has yet to learn, a number of campaign analysts argue. One of them is David Alexrod, a former senior adviser to President Barack Obama, who told Politico’s Tim Alberta that while he admires O’Rourke, he “staked out some positions that are difficult positions for some of these voters in the middle to embrace.” O’Rourke apparently hoped to offset this by recruiting new and younger voters, many of them educated liberals drawn to Texas by the booming job market. In the end, it wasn’t enough. Lincoln was careful to stick to the center, a lesson that O’Rourke might have to learn if he runs in 2020. Of course, there’s no prescription for gaining your party’s nomination—and every campaign is different. But, as Harold Holzer notes, O’Rourke could do worse than to follow Lincoln’s 1860 strategy. When I spoke with Holzer last week (on the anniversary, as he pointed out, of Lincoln’s Gettysburg Address), he provided a compelling argument that O’Rourke might begin as Lincoln did—with an address at New York’s Cooper Union, which has served as a testing ground for national candidates. “New York is a tough crowd. Lincoln had to do well there to be taken seriously, and he knew it. And Cooper Union was in Seward’s back yard, so Lincoln was throwing down a challenge.” Lincoln’s address was careful, precise, plainspoken, typically midwestern—and a resounding success. Lincoln followed with speeches in New England, but then returned home to await the outcome of the nomination vote. O’Rourke could follow a similar strategy, using a Cooper Union appearance to show that his Texas roots play well in the east, while differentiating himself from other candidates, like potentially New York’s Kirsten Gillibrand. Egerton laughs: “There was a little bit of underhandedness involved in the Lincoln nomination,” he says. “Davis printed counterfeit gallery passes during the convention, and passed them out to Lincoln partisans. They showed up early, while Seward’s people were left outside. And Davis put the Illinois delegation in the middle of the convention floor, where they were the center of attention, with Seward’s New York delegates well to the front, where no one could see them.” Lincoln won on the third ballot. Seward, and his supporters, were stunned. Elizabeth Warren and Dr. Phil are pictured. So, how far can the similarities between the two candidates take us? The process of nominating and electing a president in 1860 seems almost superficially more simple than it is today: There were no primaries, no “super delegates,” no mass mailings, no digital strategies and no shoulder-to-shoulder televised debates of half-a-dozen (or more) candidates. And, despite the controversy on any number of issues (like immigration), America is not facing “an irrepressible conflict” as it was in the mid-1800s. Then too, while Lincoln was underestimated in 1860, O’Rourke is not. And of course, Lincoln turned out to be one of the greatest leaders in U.S. history, and who knows now whether or not O’Rourke can come close to comparison. But if Beto is channeling Abe, as his post-campaign jog up the steps of the Lincoln Memorial suggests, he might do well to study the Great Emancipator’s nominating strategy. For in 1858, as in 2018 (and as Lincoln knew), it’s one thing to be in the national conversation and another thing to stay in it. The Vermont senator has indicated he would step aside if another candidate with a better shot at beating Donald Trump should emerge. “This time, he starts off as a front-runner, or one of the front-runners,” Sanders’ 2016 campaign manager John Weaver told The Associated Press, highlighting the senator’s proven ability to generate massive fundraising through small-dollar donations and his ready-made network of staff and volunteers. As much as I'm not a socialist, I'd have to vote for Bernie if he were to get the nomination, and I'd probably vote the Democratic primary this time, instead of trying to cross over to influence who gets the GOP nomination, since all possible choices there are horrible. He looks pretty good for a guy his age. I'm glad he's still got some game. You have to admire his spirit. The Democrats have nobody else, in my view. Zero electable candidates, and it looks like Hillary Clinton is still bent of making a stab at it, which would only hurt the Dems chances. I think Fusion candidates are best for the Demodopes, assuming they can get through the primary process without shredding each other to bits with negative campaigning. I think a Bernie-Liz ticket brings out the Wimmen vote and the Social Security vote also. It will be interesting to see who garners the most support in the primaries. Top vote getter should be at the top of the ticket as POTUS, next best as Veep. Beto O’Rourke, Steve Bullock, John Hickenlooper, and others are needed down-ballot. Wednesday morning, recently reelected Montana Democratic Sen. Jon Tester broke some exciting news by telling Montana College Democrats that their state’s governor, Steve Bullock, would challenge incumbent Republican Sen. Steve Daines in his 2020 reelection bid. Minutes later, Bullock’s chief of staff offered a contrary view: Not only was Bullock not ready to announce, he’s not interested in running at all. It’s easy to see what Bullock is thinking. If the national political environment that exists today continues forward to Election Day 2020, he will probably lose a Senate race in Montana. By contrast, if he somehow manages to secure the Democrats’ 2020 presidential nomination — and reports in the Washington Post, BuzzFeed, and Politico suggest he’s interested — then he’ll probably win. In other words, it’s a small-state version of the same choice facing Beto O’Rourke down in Texas. Run for Senate against John Cornyn as a distinct underdog, or take a punter’s shot at securing a chance to run against an unpopular incumbent president. In both cases, the choice has less to do with the particular qualities of Bullock and O’Rourke than it does with the basic geography of American politics. The presidency is the least gerrymandered branch of the federal government (the Electoral College gives the GOP about a 2-point edge, enough to make Trump president but smaller than their edges in the House or Senate) and therefore the prize Democrats have the best odds of capturing. Presidential nominations are always valuable prizes, but the skewed maps make them especially valuable. But from a party perspective, this cuts in the exact opposite direction. If Trump remains this unpopular (obviously a big if), there are lots of candidates who'd stand a good chance of beating him. But to govern the country, Democrats will need a Senate majority. The party will need quality candidates who run ahead of the national political fundamentals. Responsible party leaders should be doing everything in their power to recruit quality politicians like Bullock and O’Rourke to those races. A Democratic mantra throughout 2018 was that the party was facing an almost freakishly bad map, given the huge number of incumbent Democrats defending seats in states that Trump won. And that’s true, as far as it goes. Had Bill Nelson, Joe Donnelly, and Claire McCaskill managed to hold on and give Democrats a narrow Senate majority, holding that majority steady in 2020 would have been a lot easier. But they didn’t hold on, and from the standpoint of a minority party looking to win a majority, the 2020 map isn’t so hot either. Democrats have a solid pickup opportunity in Colorado, a Clinton state whose incumbent Republican Sen. Cory Gardner has done nothing to differentiate himself from Trump and the national party. They also have an okay shot at Arizona, a state Trump won with less than 50 percent of the vote and where Democrat Kyrsten Sinema just narrowly won a race last month. Maine is a Clinton state and thus a pickup opportunity, but incumbent Sen. Susan Collins is very popular and has proven extremely difficult to beat in the past. Sen. Doug Jones has to run for reelection in Alabama, and while he can always hope Republicans nominate another problematic candidate, you wouldn’t necessarily want to take that to the bank. If Democrats win all four of those races plus the presidency, the vice president will be able to break the 50-50 tie and they’ll control the Senate. If, more realistically, they end up losing in either Alabama or Maine (or both), then they’ll need to make up that ground in Texas, Georgia, North Carolina, or Montana. These are not impossible races to win, but they’re all challenging. You could easily imagine Democrats having a good year nationally even as Trump wins all four of those states. To win, they’re going to need some mix of good luck (it always helps when the incumbent stumbles for whatever reason) and good candidates. After all, even the 2022 map (when Republican seats in Wisconsin, Florida, and Pennsylvania are up while Democrats only need to defend Colorado, Nevada, and New Hampshire) isn’t all that hot for Democrats. They’d have a great chance at pickups then if Trump wins reelection, but midterms are rough for incumbent presidents unless they have a really fantastic map. And there simply is no really fantastic map for Democrats coming down the line, because the Senate’s longstanding small-state skew has become a sharp partisan skew. Right now the median state is 6 points more Republican-leaning than the nation as a whole, meaning Democrats are facing an endless series of bad maps. Given these geographic realities, there is simply no easy path to a Senate majority for Democrats. But the best path starts with quality candidates. Beating an incumbent Republican in a state as red as Montana is inherently difficult. But Bullock, who's won multiple statewide races in the state, is by far Democrats’ best shot at doing it. By the same token, O’Rourke is now known statewide in Texas and has a network of volunteers and donors who could be activated for another run. The state party is set to be in stronger shape than it’s been in a long time, since Democrats did pick up a number of down-ballot offices in the 2018 wave, and there’s no better choice to try to keep the momentum going with another statewide run. Democrats do have a solid fallback option in Texas — former San Antonio mayor and HUD Secretary Julian Castro — but he is also mucking around with a presidential campaign. Colorado is Democrats’ best shot at a Senate pickup, and the state’s incumbent Gov. John Hickenlooper would obviously be a very strong candidate. But Hickenlooper hasn’t announced a Senate bid yet, not because he’s retiring but because he’s — guess what? — pondering a presidential bid. In Georgia and Arizona, Democrats do not appear to have been driven mad by presidential aspirations, but Stacey Abrams could use encouragement to take another shot at a statewide win. It’s worth saying that in the case of both Abrams and O’Rourke, there’s nothing particularly unusual about losing candidates running for statewide office again and winning. John Thune lost a close race to Tim Johnson in 2002, and then in 2004 unseated a superficially stronger candidate in a worse national political climate. Mike DeWine, Ohio’s newly elected governor, got booted from the Senate in 2006 and then picked himself up off the floor and got elected state attorney general four years later. Politics is weird and unpredictable, but parties put themselves in position to succeed when they get quality candidates to run. In the longer term, obviously, Democrats need a structural fix for their map woes. Admitting DC, Puerto Rico, and the US Virgin Islands as states polls well nationally and would partially offset the current partisan skew of the Senate. It’s possible that the actual inhabitants of Puerto Rico and the USVI wouldn’t go for it (the state of DC opinion is a lot clearer), but there’s no earthly reason Democrats shouldn’t pursue fair referenda and quick statehood for these Americans territories. In the longer term, more exotic ideas — like dividing California, Texas, Florida, and New York into a larger number of smaller states to bring population disparities closer into line with what the founding generation experienced — are worth pursuing. But none of this is possible without winning an election first, and to win that election Democrats are going to have to fight on a skewed map. The ongoing power grabs in Wisconsin and Michigan should remind Democrats that if the 2020 election leaves Republicans in charge of the Senate, they will likely use that authority in unprecedented and aggressive ways that make it completely impossible to govern. And while the presidency is a more important office than any single Senate seat, the recruitment of quality candidates probably matters more on the Senate side precisely because the map is so skewed. It’s completely understandable that individual ambitious politicians are gazing at the White House, but party leaders, operatives, donors, elder statespeople, etc. have a serious obligation to discourage this trend and push talented politicians into the Senate races where they are needed. The progressive group had backed Bernie Sanders in 2016 over Hillary Clinton. An early straw poll of members of the progressive group MoveOn.org shows a wide-open competition for liberal voters in the 2020 Democratic presidential contest, with Rep. Beto O'Rourke narrowly beating out former Vice President Joe Biden. The poll, obtained by NBC News, shows a plurality of respondents — 29 percent — either said they did not yet know whom they would support or wanted someone else not listed among the group's more than 30 potential candidate choices. The three men were followed by Sen. Kamala Harris, D-Calif., who garnered 10 percent support, and Sen. Elizabeth Warren, D-Mass., with 6.4 percent. Meanwhile, three Democratic senators, Sherrod Brown of Ohio, Amy Klobuchar of Minnesota and Cory Booker of New Jersey, and former New York City Mayor Michael Bloomberg were each selected by about 3 percent of members. "While the race for the 2020 Democratic nomination for president remains wide open and MoveOn's endorsement is up for grabs, MoveOn members and progressives across the country are clear: They're looking for candidates who will rally voters around a progressive vision of building a country where every American can thrive — whether we're white, black, or brown, rich or poor," said Ilya Sheyman, executive director of MoveOn Political Action. "We'll be challenging prospective candidates to inspire us with big ideas in the months to come — including at a series of events in early voting states in early 2019," Sheyman added. MoveOn, which was founded during Bill Clinton's presidency, is one of the largest progressive online organizing groups with millions of members across the country, so its endorsement has been coveted in the past. This year, the group plans to hold a series of events in early presidential nominating states as part of its endorsement process, which is ultimately decided by a vote of its members. Beto & Kamala is a winning ticket. Winner of the primaries gets the top spot as POTUS, loser gets Veep. (CNN)It's Beto O'Rourke's world, every other Democrat is just living in it. THE POINT -- NOW ON YOUTUBE! Sen. Lamar Alexander, a Republican from Tennessee who is currently in the middle of his third Senate term, announced on Monday that he would not seek reelection in 2020. "I will not be a candidate for re-election to the United States Senate in 2020. The people of Tennessee have been very generous, electing me to serve more combined years as Governor and Senator than anyone else from our state," Alexander said in a statement. He added that "I am deeply grateful, but now it is time for someone else to have that privilege." Alexander has a long career as an establishment Republican. After serving as governor of Tennessee for two terms from 1979 to 1987, he became Secretary of Education under President George H. W. Bush from 1991 to 1993. In 2002, a year when Republicans benefited from post-9/11 sentiments to overperform despite holding the White House (a status quo that usually works against the incumbent party), Alexander was elected to his first Senate term. He was reelected in 2008, even though that was a Democratic year, and again during the GOP-favorable climate in the 2014 midterm elections. It is unclear which Republican could replace Alexander in Tennessee. Although the outgoing Gov. Bill Haslam declined to seek the seat being vacated by Republican Sen. Bob Corker earlier this year, he may change his perspective now that his own gubernatorial term is ending. If Haslam did decide to seek the office, he would immediately be considered one of the frontrunners and could have a decisive edge over his potential competitors. The state's GOP members of Congress will also be closely watched. A Donald Trump-style candidate, potentially like Rep.-elect Mark Green, could emerge. The Tennessee Republican, speaking on the condition of anonymity to discuss the potential field frankly, also pointed to Rep. Chuck Fleischmann, former Rep. Stephen Fincher (who lost the 2018 Senate primary to Sen.-elect Marsha Blackburn), US Ambassador to Japan Bill Hagerty and orthopedic surgeon Manny Sethi, who co-edited a health policy book with former Sen. Bill Frist. Alexander's announcement comes shortly after he prominently criticized a recent decision by a Texas court to repeal the Affordable Care Act. Although Alexander is an opponent of the law, he explained in a statement that "if the U.S. Supreme Court eventually were to agree that Obamacare is unconstitutional — which seems unlikely, however poorly the law was written — I am confident that any new federal law replacing it will continue to protect Americans with pre-existing conditions who buy health insurance." Liz came out 2nd in the survey behind Joe Biden as most likely nominee by the Demodopes. Sen. Elizabeth Warren (D-MA) attends the Rev. Al Sharpton’s National Action Network post-midterm election meeting in the Kennedy Caucus Room at the Russell Senate Office Building on Capitol Hill November 13, 2018 in Washington, D.C.
Sen. Elizabeth Warren has made it official: she is jumping into the presidential race. The Massachusetts Democrat became the first major Democratic candidate to enter the 2020 contest when she announced Monday that she is forming an exploratory committee. That key step allows her to hire staff and start raising money before she formally kicks off her candidacy in what is likely to be a crowded Democratic primary. Others, including some of Warren’s fellow senators, are also getting ready to make announcements of their own, and some are expected within days, according to the Washington Post. “America’s middle class is under attack,” Warren says in a four-minute, 30-second video emailed to supporters Monday morning in which she made the announcement. “How did we get here? Billionaires and big corporations decided they wanted more of the pie. And they enlisted politicians to cut them a bigger slice.” Throughout the video, Warren leans in to her reputation as an anti-Wall Street crusader who has a working class background and has long advocated for stronger consumer financial protections. Warren’s candidacy hardly comes as a surprise. Many progressives pushed the senator to run in 2016 but she passed. President Donald Trump is likely to be happy that Warren is entering the field as he seems to have been preparing to run against her. The president has frequently criticized her and seems to take great pleasure in calling her “Pocahontas” in reference to accusations that she has misrepresented her Cherokee heritage for professional gain. Earlier this year, in a move many saw as confirmation that she was getting ready to launch a presidential bid, she released the results of a DNA test that showed she did have Native American ancestry. Yet that move also engulfed her in controversy as many progressives criticized her move, saying she took Trump’s bait and in the process “put too much emphasis on the controversial field of racial science,” as the New York Times put it in a piece earlier this month. It hardly seems a coincidence that the video she emailed to supporters Monday made no mention of the DNA test. Other senators that are expected to announce presidential runs include Cory Booker of New Jersey, Kamala D. Harris of California, Sherrod Brown of Ohio, Amy Klobuchar of Minnesota, Kirsten Gillibrand of New York, and Bernie Sanders of Vermont. Former Vice President Joe Biden is also seen as a possible contender. First, she’ll need to distinguish herself from the crowd (A less cranky Sanders? A more progressive Gillibrand?). While she may drain support away from Sanders, her toughest competitor for the blue-collar populism crowd might be Brown, whose everyman style and Rust Belt roots give him an advantage over a wonkish former law professor. Second, and perhaps most critical, is the challenge of finding a voice and a message that will appeal both to Democrats’ hearts and heads. Certainly, primary voters want to swoon over an articulate, charismatic figure, but more than anything, they want to win. Warren will have to wow voters with passion while convincing them she can hold her own against Trump, a task made harder by her DNA flub. Warren is expected to unveil a travel schedule soon that will see her going to the first presidential primary states in the coming weeks, including Iowa and New Hampshire. Iowa is holding its caucus in early February 2020. He's gonna run for POTUS, no doubt about it as I see it. I think his strategy is a good one. It's going to energize HIS base, which is the young voters. This assuming of course he survives this unaccompanied Roas Trip and some "Psycho" with 3 names doesn't plug him before he has a not-so-Secret Service retinue with him. His musings might be mocked but he’s generating a torrent of media coverage. All of which is unfolding as the rest of the Democratic presidential field has broken into a sprint — Elizabeth Warren to New Hampshire, Kirsten Gillibrand to Iowa, and Bernie Sanders and Cory Booker to South Carolina. O’Rourke’s potential rivals are courting donors, assembling staffs and scurrying to early primary states, while the former Texas congressman is at the Pancake House in Liberal, Kansas, some 500 miles from Des Moines. His absence from the fray has been noted — and his introspective writing style has been mocked. But amid much snickering, there is also evidence to suggest that if he does run for president, it could help him politically, advancing his off-beat brand. “Beto is able to drive his own message," said Robby Mook, Hillary Clinton's 2016 campaign manager. In a political environment where “the person is the message,” Mook said, “what makes him snacky for [the media] inevitably makes him refreshing and different for voters ... The press writes about what Beto decides to do on his own, not in the context of Trump. That's a big deal." With his online following, O’Rourke remains close to the 2020 conversation regardless of his location. And in the span of several days, he has generated a torrent of media coverage that — unlike Democrats in more public settings — he alone can control. 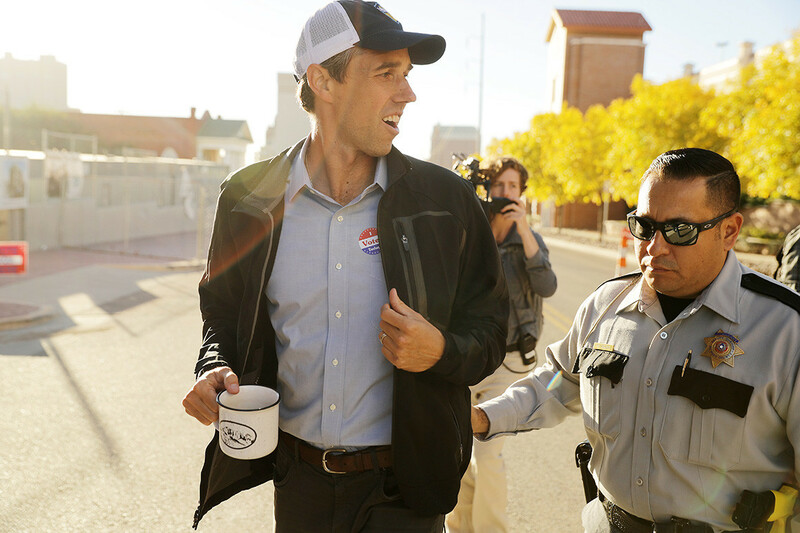 Officials at Oklahoma Panhandle State University, in Goodwell, said they only learned about two hours beforehand that O’Rourke was coming to campus, when an aide called to alert them. The school prepared a room, and several dozen students turned out, said Ryan Blanton, the university’s vice president of outreach. Yet to O'Rourke's benefit, there was no major media outlet on hand to cover the event in the moment — just as there were no reporters shouting questions at O’Rourke at the university or in Tucumcari, New Mexico, or at the Starbucks in Pueblo, Colo. The story has become whatever O’Rourke makes it — “Over-the-top, authentic, refreshing,” according to Slate. “Epic, rambling,” said Fox News. Even when the analysis has been critical — a sharp-edged CNN story Thursday asserted O’Rourke’s meandering trip “drips with white male privilege" — it is keeping O’Rourke in the news. O’Rourke is leaning toward running for president, according to at least four sources who have spoken to him or his advisers, and his former advisers have been quietly sketching the outline of a potential presidential campaign. The former Texas congressman will participate in Oprah Winfrey’s “Oprah’s SuperSoul Conversations from Times Square,” a live event on Feb. 5. Kirsten Gillibrand holds a news conference in Troy, N.Y.
“I think some of his friends ought to look at a temporary commitment,” he said. Most politicians have at least one junior staffer join them on trips to collect contact information from potential supporters or donors — and actually do the driving. If O’Rourke is not pre-campaigning, Rendell said, but genuinely reflecting, he suggested that O’Rourke stop posting about it online. There is precedent for politicians taking to the road. Former Florida governor and Sen. “Walkin’” Lawton Chiles walked for months across Florida in his 1970 Senate campaign. In the last presidential election, Clinton saved her journey — a beefier spectacle, complete with her security detail — for after she announced her candidacy. “Road trip!” she wrote on Twitter before setting off in a van nicknamed “Scooby” from her home in New York to Iowa. Delegates cheer at the 2016 Republican National Convention. That trip was meant, in part, to persuade Americans that the candidate could be unscripted and relatable, with a stop at a Chipotle in Ohio that — after security footage confirmed her presence — resulted in a flurry of coverage. For some politicians, the purpose of a road trip is “to kind of get out of the bubble, and just go out and meet real folks,” said Garry South, a longtime Democratic strategist who sent one of his candidates, Alex Seith, on a road trip across Illinois in his 1978 race for U.S. Senate. The purpose, South said, was not to “impact voters in any kind of massive way,” but to help the candidate. In O'Rourke's case, Mook said, "Unorthodox is a viable strategy." "I think he's being really genuine," he said. "Going into the proverbial wilderness to figure out what his purpose is."  Assuming you are not a Complete Imbecile and won't vote for Trumpovetsky in..
...2020, which of these Demodopes gets your vote and should be the Nominee for this party, since no 3rd Party can win in the FSoA?